Sudoku Almost Finished! | NJNA is Blogging! I need to get a second spool of Kreinik braid and decide what to do about the borders of the nine sections…but I’m getting close! 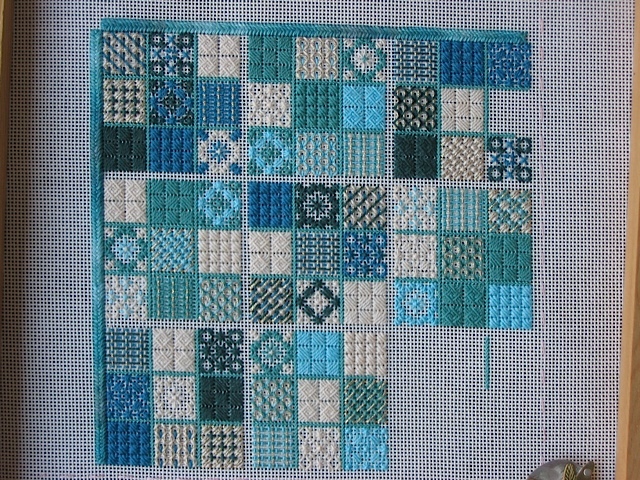 This has been a lot of fun to stitch, and seeing how different the same set of stitches look depending on the arrangement of the threads has definitely been educational. You can see how heavy the outer border (Watercolors) is compared the the single ply of silk of the innermost dividers…And the shine of the gold braid doesn’t show in this photograph. It really gives the piece a nice sparkle when seen in person.